The Cahokia High School sophomores’ “How to Make Saltwater Drinkable” exhibit received an outstanding ribbon, the American Meteorological Society Certificate of Outstanding Achievement and the Stockholm Junior Water Prize Regional Award. The participants were Joshuwa Wright and Tremaine Jack. The students noted the value and importance of H2O. “Water is the only substance that helps people survive,” Wright said. “Water is the best thing on Earth,” Jack added. Winning a first place ribbon were the remaining Upward Bound STEM teams: “Do Tea, Soda and Coffee Stain Your Teeth?” by Cahokia High School sophomores Darielle Odom, Jevon Clark, Jason Lacy and Kevin Strader. 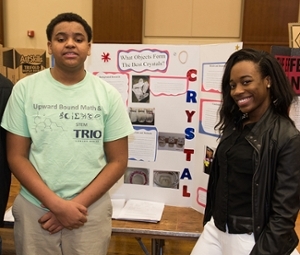 “What Objects Form the Best Crystals?” by 10th graders Dimitri Ennis, Cahokia High School, and Ti'Aja Fairlee, East St. Louis High School. “The science fair was a lot of fun, and I love doing it,” Odom said. More than 250 regional students from grades 5-12 participated in the SERC. The goal of the competition was to help students advance their thinking, confidence and interest in science, technology, engineering and math (STEM). 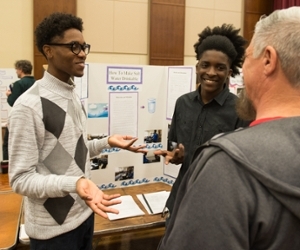 Upward Bound Math and Science students Joshuwa Wright (left) and Tremaine explain their project, “How to Make Salt Water Drinkable,” to SERC judge Kim Bateman, program director of the Environmental Resources Training Center (ERTC). 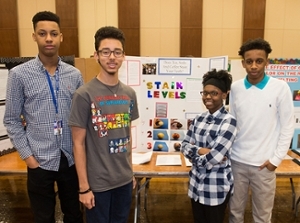 Shown with their project: “Do Tea, Soda and Coffee Stain Your Teeth?” are Upward Bound Math and Science students (L-R): Jason Lacy, Kevin Strader, Darielle Odom and Jevon Clark.